Travel before 15th April 2019 and enjoy discounts of over 15%! Discover New York at your own pace and get a real flavour for the city. Ride aboard one of the double-decker buses and see all the famous sites in Manhattan as you hop on and off at any of the 50 stops around the city. 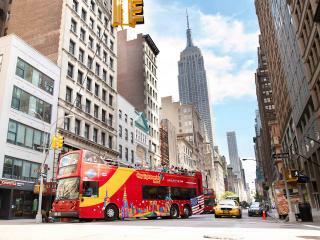 On board the double-decker buses, an informative guide tells you about all the famous sites in Manhattan. This is a great way to see New York City's landmarks at your own pace! All Around Town Tour Hop-on Hop-Off Bus Tour tickets allow you to ride on all the following tour loops. Buses run daily except Christmas Day and New Year's Day. Downtown Loop - See the Empire State Building, Greenwich Village, SoHo, Little Italy, Chinatown, Financial District, Battery Park (departure point for Statue of Liberty/Ellis Island ferry), South Street Seaport, Times Square, Rockefeller Plaza, Radio City, United Nations, 42nd Street, St.Patrick’s Cathedral, Fifth Avenue and more. Buses run every 20-25 minutes from 8.00am to 6.00pm. The loop takes around 3 hours in total although you can hop on and hop off at any of the convenient stops giving you the chance to explore local attractions before continuing your tour. Uptown Loop - See Central Park, Lincoln Center, Theatre district, Rockefeller Plaza, Radio City, St.Patrick’s Cathedral, Fifth Avenue, American Museum of Natural History, Cathedral of St. John the Divine, Harlem, Metropolitan Museum of Art, Guggenheim and other famous cultural attractions on Museum Mile, the Apollo Theatre and Harlem neighbourhoods. The loop takes around 2 hours in total and you can hop on and hop off at any of the convenient stops giving you the chance to explore local attractions before continuing your tour. Buses run every 25-30 minutes from 9.00am to 5.00pm. Brooklyn Loop - Visit Brooklyn to experience its rebirth and the new generation of Brooklynites contributing modern ideas on art, music, food, fashion and more. You’ll see aspects of Brooklyn’s previous golden age like the charming brownstones, the beautiful Brooklyn Botanic Garden, Brooklyn Museum and the Brooklyn Bridge. Stops include rooklyn Promenade/ Cadman Plaza, Atlantic Avenue, Barclays Center, Brooklyn Museum of Art and Botanic Garden, Brooklyn Public Library, Fort Greene Park and Brooklyn Academy of Music. Also see Old Fulton Landing, Grand Army Plaza, Brooklyn Bridge and enjoy views of the amazing Manhattan skyline. Buses depart every 25-30 minutes between 10.30am and 3.30pm from the Park Row stop (City Hall/Brooklyn Bridge/World Trade Center). The loops takes around 2 hours in total. Night Tour - (Not hop-on, hop-off) View over 20 sites from Central Park, Times Square, Empire State Building to Greenwich Village, Soho, Chinatown and Little Italy at night. See all the glittering lights of 'the City that never sleeps' as you stop in Brooklyn for magnificent views of Manhattan’s skyline. Buses depart at 6.30pm (Winter only), 7.00pm, 7.30pm and 8.00pm. The Night Tour lasts around 2 hours. Admission to your choice of the Museum of the City of New York or The New York Historical Society. You will instantly receive a mobile-ready All Around Town Tour Hop-on Hop-Off Bus Tour ticket which can be used straight away at any hop-on stop. Tickets are valid for 48 or 72 hours from the time of redemption. Bus Tours and Cruises do not operate on Christmas Day and run a reduced service on New Year's Eve. Do I need to choose a specific date for my tour? No, you will be sent an open-dated All Around Town Tour Hop-on Hop-Off Bus Tour Ticket. This can be used at any time. Is there a limit to the number of times I can hop on and off the bus? No, your ticket is valid for 48 or 72 hours from the time you first scan your ticket and you hop-on and hop off the buses as many times as you like during this time.